Jugend Eine Welt – Don Bosco Aktion Österreich is an Austrian aid organisation that has been working to improve the future prospects of children and young people on the margins of society around the world since 1997. Following the principle “Education overcomes poverty”, Jugend Eine Welt supports aid projects, schools, programmes for street children and education projects in Asia, Africa, Latin America, the Middle East and Eastern Europe. Jugend Eine Welt’s project partners are primarily works of the Salesians of Don Bosco (16,000 Salesians in over 130 countries) and the Don Bosco Sisters (13,000 sisters in over 90 countries) as well as some smaller religious orders and local NGOs. Through our worldwide network, disadvantaged children and adolescents are given the chance of a better future: they are taken in and shown affection, can go to school again, receive training and, above all, are cared for in every respect and so have the chance to lead a successful life. 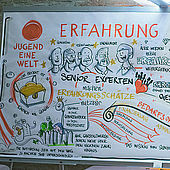 The Jugend Eine Welt project partners live with the children and young people entrusted to their care. They are thoroughly familiar with the local situation which means that they are extremely reliable partners, even in the event of natural disasters or situations of armed conflict. In the case of a disaster, the Jugend Eine Welt centres often serve as refuges. This means that Jugend Eine Welt can help quickly and unbureaucratically. However, supporting reconstruction work is equally important: this is because young people are particularly badly affected by natural disasters and armed conflicts and the resulting movements of refugees. There is often the danger of the emergence of a “lost generation”. In Austria, Jugend Eine Welt works to make these global interdependencies visible and is untiring in its efforts to raise funds. These are used to help children and young people who are given a future by Jugend Eine Welt’s worldwide projects. Jugend Eine Welt and our partners give young adults and adults with professional experience the opportunity to do a period of voluntary work in one of our social projects that are conducted all over the world. For over 20 years we have been working with the conviction that the life’s work of the pioneer of social work and patron saint of young people Don Bosco is worth continuing on a global scale so that the lives of young people the world over are a success. Jugend Eine Welt has carried the donation seal of approval since its introduction.